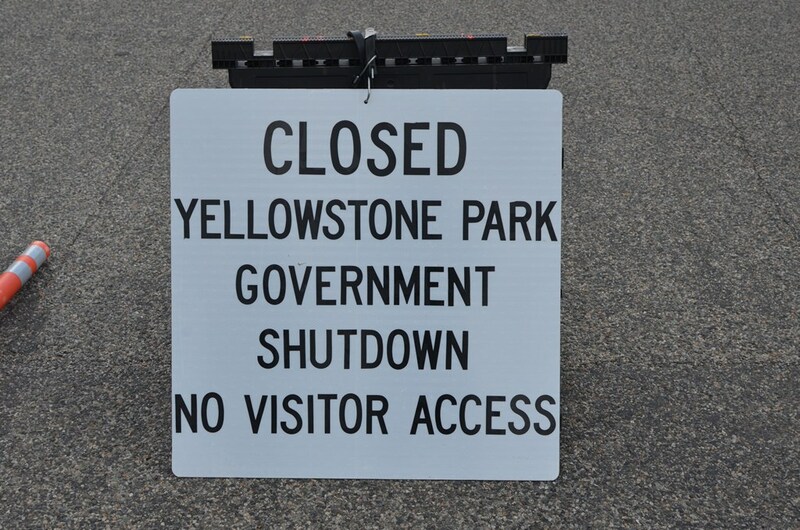 Home Road Trips USA 2013 Yellowstone closed! It is October 1st, which is the start of the new federal fiscal year and as a result of endless political conflicts among Democratic President Barack Obama, the Democratic-controlled Senate and the Republican-controlled House of Representatives; specifically, the House’s refusal to fund government operations without delays or changes to the Patient Protection and Affordable Care Act and the Senate’s refusal to accept such conditions (Source: Wikipedia) the United States Federal Government has shut down all “non-essential” services with immediate effect. Also affected are all the National Parks – we think this is very embarrassing for the U.S. Since we already did a tour outside the park yesterday due to the bad weather, we are pretty disappointed even more so because the weather seems to be better today! Well, it is what it is and we have to opt for an alternate route again today. We check our blog from two years ago and head for the Antelope Basin Road. On the way there we pass Earthquake Lake again but then head south onto HWY 87. Along the main road﻿ we see lots of antelopes that are roaming the vast grass lands we are passing. Once we are off the HWY we do not see any animals anymore – it is hunting season. Only towards the end of our off-road tour we see three deer. We still enjoy the day and the gorgeous scenery of Montana and Idaho. We get a feeling how big this country really is. Mountains, grasslands, lakes and endless meadows, very few houses and some farms. It is breathtaking!